Inspired by the 2011 Malawi protests against the government which resulted in 20 deaths and nearly 100 injuries, leading Malawi theater company Nanzikambe Arts responded with an adaptation of Dario Fo‘s 1978 play La storia della tigre. Originally inspired by Fo‘s 1975 trip to China, this dramatic monologue tells the story of a revolutionary Chinese solider wounded during Mao‘s Long March and left to die by his comrades. Nursed back to health by a mother tiger, he returns to civilization determined to cure its ills. In Thokozani Kapiri‘s international adaptation intended for both African and European audiences, Geoffrey Mbene provides a tour-de-force performance relying heavily on pantomime and physical theater. 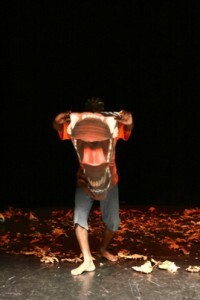 This production of The Story of a Tiger, commissioned by Theater Konstanz as part of its three-year partnership with Nanzikambe Arts – Crossing Borders, von See zu See – received 10 different presentations in Germany in 2012. It was also performed at Mwezi Wawala International Arts Festival, Blantyre Arts Festival and Malawi Cultural Arts Festival, in Austria and in Ireland in 2013.